The incisors and cheek teeth of rabbits are called aradicular hypsodont teeth. These teeth grow or erupt continuously. The growth is held in balance by dental abrasion from chewing a diet high in fibre. Abscesses of the oral cavity in rabbits can be particularly challenging. Abscesses can develop as a result of bacteria via gum trauma, punctures or lacerations. These injuries may be a result from feed or dental malocclusion. Dental abscesses can be the result of endodontic disease. Dental trauma can result in tooth defects that allow bacteria to penetration into the pulp tissues. Infected pulp may result in a dead tooth, which then serve as a nidus of infection. The infection may spread to local bone causing osteomeylitis and possible bone necrosis. Abscesses in rabbits are caused by multiple bacteria with Pasteurella multocida being very common. Other bacteria include Staphylococcus aureus, Pseudomonas aeruginosa, Proteus sp and Bacteroides sp. Abscesses of the head may be secondary to dental disease, food or foreign bodies packed into the gingival sulcus, tooth fracture, tooth root abscess, or a foreign body penetration of mucosal tissues. 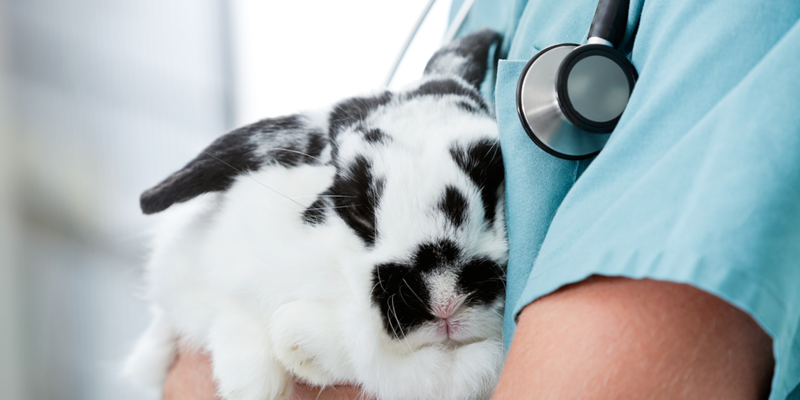 Abscesses occur in rabbits of all ages. They may develop over a long period of time or very rapidly. The abscess seems to be nonpainful. Animals with abscesses may appear unaffected. We do know that the anatomy, physiology and neurology is similar in rabbits to humans. And from our own human experience, dental abscesss may be very painful, then become quiet and non-painful and return with excruciating pain. Rabbits with dental abscesses will often show excessive salivation and may become completely or partially anorectic. Pain management is recommended when dental abscesses are diagnosed. Dental abscess may be suspected by feeling soft or firm swellings, dental xrays and bony changes. Teeth may be mobile when there is extensive bone involvement. Abscesses in rabbits will often be surrounded by a soft tissue fibrous wall. The wall of the abscess is thick and usually contains bacteria, with a consistency of cottage cheese. Dr. Clarke believes that a surgical approach is superior to medical management of dental abscesses in rabbits. Dead teeth and bone must be removed. At Dental Care for Pets all rabbits undergo general anaesthesia using an endotracheal tube and a safer Isoflurane gas, are placed on a drip (IV fluids) and relieve adequate pain control and heat (warmth) during the procedure. The placement of implanted antibiotic impregnated beads increases treatment success. Primary incisor malocclusion is most common in young rabbits. If incisor malocclusion is the only problem in young rabbits, it is likely to have a genetic origin ( Verstraete, FJ et al, Dentistry in Pet Rabbits Compendium Sept 2005). In small rabbit breeds there is often a disparity on jaw length. The maxilla is short relative to the mandibles. This condition may be called maxillary brachygnathism. In these animals, the jaw length prevents normal incisor occlusion and wear. The upper incisors elongate and curl inward. The lower incisors elongate and protrude. The result is soft tissue trauma. In older rabbits, incisor malocclusion is often secondary to cheek teeth malocclusion. This is often related to diets that do not allow normal chewing. As the cheek teeth gtow, the bite opens and results in incisor malocclusion and elongation. Incisor malocclusion may also be a result of injury to incisor teeth. Fractured teeth may result from trauma such as a fall or tooth entrapment in a cage. Injury from teeth clipping can also result in tooth fracture. Fractured teeth may grow in an abnormal fashion and in some cases the teeth die. Incisor malocclusion is a life threatening condition that must be treated. These animals have difficulty or an inability to pick up and eat food. The need for regular trimming (every 4-6 weeks) becomes inconvenient and expensive for most clients. Dental extraction of the incisors offers a more permanent solution. Familiarity with the incisor anatomy is important if the veterinarian is considering extraction of these teeth. The upper incisors are paired teeth on the left and right sides. The front incisor is larger than the distal smaller (peg) tooth. The larger incisor is in the formation of a half circle. The smaller peg tooth is roughly half as long as the larger incisor. The mandibular incisor is longer than the upper incisor and its curvature is broader. Dr Clarke regularly performs this procedure at Dental Care for Pets.